Today, I got a tattoo. I’ve never wanted a tattoo. I’ve never even really considered getting a tattoo. In fact, I still don’t think I completely understand what permanence means. I think this is why I know that getting a tattoo was the right decision. 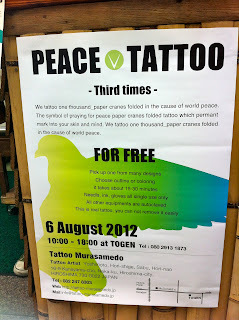 For the past 2 years on August 6th, the anniversary of the A-bomb being dropped on Hiroshima, Japan, Yoshimoto and his apprentices (including my artist, Sabu) give out free origami crane tattoos to support world peace. During this day there are speakers, including the Japanese Prime Minister, and an extremely moving lantern ceremony in order to honor the victims and encourage future peace initiatives. Cranes have long been known as birds of happiness and of peace. They are the only birds that fly nonstop from destination to destination; therefore, cranes are seen as birds of strength and endurance. If the wind is strong cranes swallow sand or carry stones for ballast. They stay on their path without letting anything get in their way. Cranes fly in order, with the leader guiding the flock with a shrill voice when the leader becomes tired or his voice gives out, another takes his place. They work together to reach the same destination, or mission, if you will. At night cranes take turns keeping watch for enemies. The one who is on duty holds a stone up with one claw; if the watcher falls asleep the stone will fall and wake him. In biblical context the sentinel crane represents those who provide goods for others in common, and watch over the obedience of their brothers, protecting them from devils and the incursions of this world. The stone held in the claw is Christ; the claw, the disposition of the mind, so that the one who stands guard over themselves or others should carry the stone of Christ in his mind. If such a man falls asleep in sin, Christ the stone will fall from his mind. Then he must cry out by means of confession. I aim to carry God in my heart and let his light shine through me, illuminating others. I also believe there is great value in community and accountability, so when I lose my grasp of Christ, my brothers and sisters are there for me to throw me a stone (not at me). Legend has it that the crane’s legs grow before its wings do, suggesting that the bird has a strong tie to the ground. The crane is a soaring bird and like that of the human spirit it knows no limit. They fly high in the air so they can see the lands they seek; they chose a perspective where they can see as much as possible. They fly with their neck and head outstretched as if they were seeing into the future. Their legs extend out behind them holding them to the past. When the past and the future meet, wisdom awakens. I desire to be grounded in Christ, which enables me to fly freely through life (and beyond). This beautiful bird helps me release my fear as I move into uncharted territory. It helps me discover my personal grace and agility. It teaches me to express myself with integrity and conviction and most importantly it restores my faith in God’s creation. The crane is a powerful and auspicious totem in almost all cultures. This is interesting to me because its positive attributes have been admired universally; the bird’s appreciation is not limited by the background or by the language of the observer. In China and Japan, cranes were associated with longevity, immortality, and prosperity (their lifespan is about 20-80 years, which, at the time, was a long life. This reminds me that everything is relative and is based on the context and perspective of the interpreter). In Japan, because of their permanent pair bonds, cranes were often featured on bridal kimonos. Sweet cakes to be served at Japanese weddings are often baked in the shape of cranes, for good luck. In Ancient Greece, cranes were representative of Apollo, the sun God while the Japanese believed the powerful cranes carried the souls of the recently deceased to paradise on their wings. In one of Aesop’s fables, a peacock laughs at the duller crane. The crane admits that it may not be as visually stunning as the peacock, but it has the capability to soar to the very heavens, whereas the peacock is stuck on the ground. The moral of the story is the commonly repeated adage, “Fine feathers do not make a fine bird.” I may not have fine feathers but God makes me aerodynamic with the contentment he provides. Origami started in China and was introduced to Japan by Buddhist monks. Paper folding was documented for the first time in 1797 in the book called “Folding of 1000 Cranes Cranes“ (Senbazuru Orikata). The concept that there are several ways to reach the same end product is truly beautiful. Everyone has his or her own preference in paper, size and even how to fold it, yet share the goal of producing the same end product. Origami takes time, precision and patience. It has been a stress outlet for me and it helps me keep centered. Creating art from something as simple as a piece of paper and then using that to represent something as profound as peace and happiness brings the simplicity full-circle. Shortly after the end of World War II, the folded origami cranes came to symbolize a hope for peace through Sadako Sasaki and her unforgettable story of perseverance. Diagnosed with leukemia after being exposed to radiation after the bombing of Hiroshima, Sadako became determined to fold 1,000 cranes in hopes of recovering good health, happiness, and a world of eternal peace. Although she completed 644 before she died, her classmates folded the remaining 356 to honor her. A statue was raised in the Hiroshima Peace Park to commemorate her strong spirit. 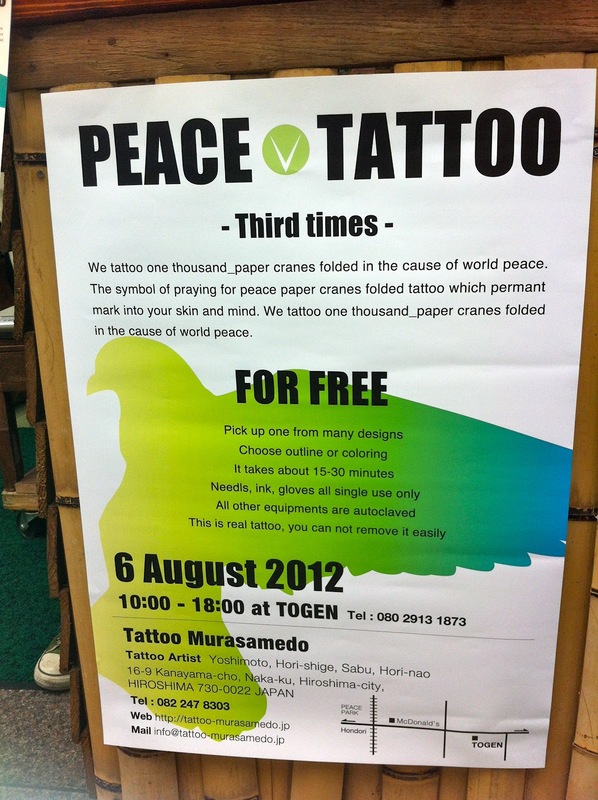 This is a perfect example of how the Japanese people collectively promote hope, peace and understanding and have undoubtedly earned my respect. The origami crane connects the meaning of the crane, origami and Japan to me in a way deeper than ink can do justice. The point of getting this tattoo in particular is quite unique. I am not getting an artsy design to decorate my body or to set me apart from others (not that there’s anything wrong with that). 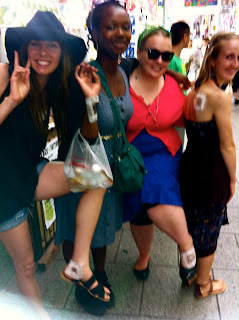 Both strangers and my dear friends got the crane tattoo. The beauty in getting the same design is to unite us. 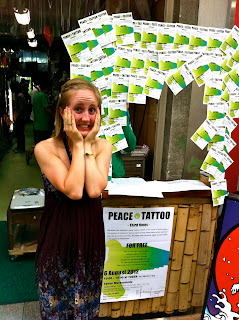 We might have a range of ideas of what it means to us personally, but one thing that is across the board is peace. Quite honestly the thought of permanence makes a good dose of fear run through my veins. But the more I think about it, the more comforting it is. One of the only constancies in my life has been God’s faithfulness; He’s my strength and my hope. Change and God are the only things I can count on and that’s what I love about life. The symbolism of the origami crane is not a phase, nor something that I want to disconnect from. God is between its folds and gives it flight; it gives me warm sense of safety. The location I chose is also of significance. Initially, I wanted to get it in a location where it would be more hidden, but then a friend reminded me about the purpose of the origami crane as a tattoo. It is not something to be ashamed of or kept a secret; it is meant to be shared. 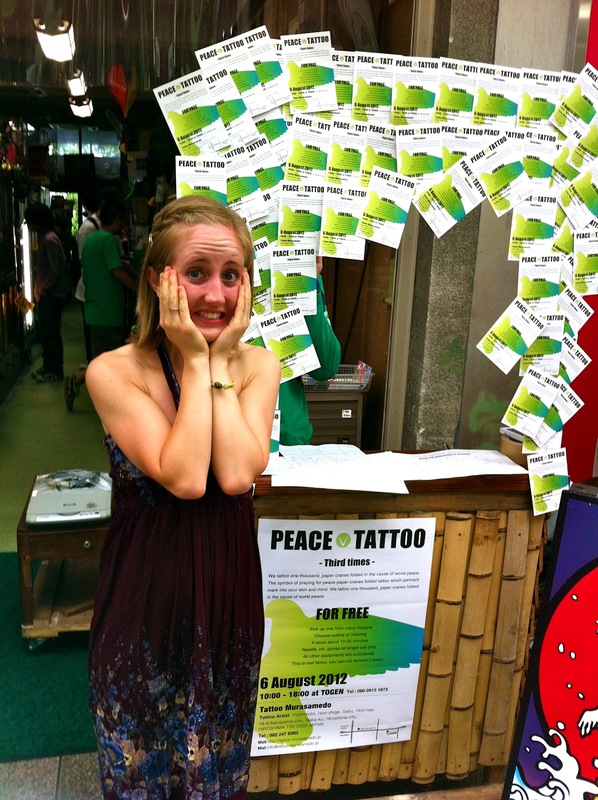 Although my forehead was a good runner up, I chose not to get it in a place that would hinder me professionally. It is placed on the right side of my upper back so that it will balance out my heart (which is located slightly on the left side) and will keep watch over things in my blind spot. I’m not going to lie, there was very little left of my nails by the time I made it to the tattoo room. Once I made it to the room it was just like skydiving, I was overwhelmed by a strange sense of calmness and had no fear of "jumping". Much to my surprise it didn't hurt at all and was done in about 10 minutes. My artist's name is Sabu, he thinks we are soul mates. He hugged.